How Does Your Flywheel Turn? Written by KV on Monday, 03 August 2015 17:15. Any student of business has likely heard of the Flywheel and the Doom Loop concept by Jim Collins (Good to Great, 2001, HarperColins), but few students of today have actually seen a true flywheel. I'm not talking about the little flywheel that is in your car or watch. I'm talking about the flywheels that powered the great factories and mills of our country's Industrial Revolution. I visited an old textile mill in North Andover, Mass. recently. A local restaurant had set-up shop among the restored inner-workings of the mill. 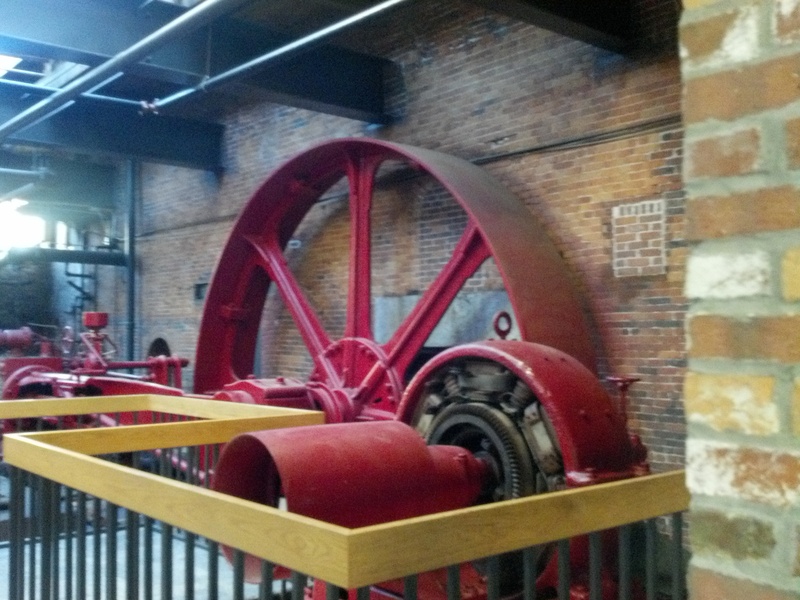 The largest part of the restored mechanics was the flywheel. It was clear that back 'in the day' when this thing turned, lots of things happened by design. And when it didn't, nothing happened. Getting the flywheel to turn and gain momentum while engaging many other gears and mechanisms is a fundamental point of Collins' flywheel concept. What impressed me enough to include this pic (and ultimately write about it here), was realizing the wheel's enormous power potential. Seeing its weight and how many things were connected to it made it clear that these things drove everything. Getting that wheel to turn, and keeping it turning, took enormous effort. And once it got turning, it required sustained effort to keep the momentum along with a healthy respect for the power it gathered with every turn. After all, these solid iron power wheels had the potential to spin out of control, sending too much power down the line at once and causing lots of problems - or worse, actually exploding from their own force*. Nobody wanted to be anywhere near a flywheel out of control. Therefore, the ability to manage the force of these enormous wheels day after day meant success or failure for mill production. And just about every family of the day depended on their work at the mills. So there it was: the flywheel. Requiring tremendous effort to get it turning and discipline to keep the momentum at a level so as not to spin out of control. Both are needed to avoid what Collins refers to as the Doom Loop: a slow but certain trajectory to the bottom. One might think the Doom Loop is a flywheel that isn't turning. But it's worse then that. Collins illustrates the Doom Loop as the flywheel in reverse. It's not just low or no production, it's the expenditure of precious resources getting the wheel to turn, then stopping it, then starting it again, then stopping, etc. The effect of re-directing, second-guessing, indecision, lack of discipline, lack of vision, etc. If the wheel never gains critical momentum, it means certain doom for the organization. Lots of activity, lots of resources expended, not a lot of results. I had always grasped Collins' reference to the Flywheel and Doom Loop, but this gave me new perspective. How productive, safe and powerful these mechanisms were when knowledge and discipline were evenly and methodically applied by the people working in the mills. And how reckless, dangerous and life-altering they could become in the absence of this discipline. Of course my mind went to strategic planning and how a solid strategic plan, thoughtfully crafted and methodically executed and monitored can change the experience for everyone involved. I rarely encounter a business that isn't very busy making their proverbial flywheel turn. That's rarely the problem. The true challenge is being 100% certain that the wheel is indeed turning the right direction and at an even keel that empowers teams, sustains production, and maintains structural integrity. Look around. Examine where and how the energy is being directed and applied in your organization and ask yourself: How is the flywheel turning? * Environmental Control & Safety Management, Vol 11, 1906, Pennsylvania State University.